The domain within your query sequence starts at position 51 and ends at position 85; the E-value for the ZnF_U1 domain shown below is 5.02e-9. 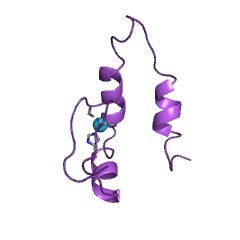 Family of C2H2-type zinc fingers, present in matrin, U1 small nuclear ribonucleoprotein C and other RNA-binding proteins. 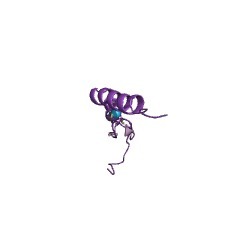 This entry represents U1-type zinc finger domains, a family of C2H2-type zinc fingers present in matrin, U1 small nuclear ribonucleoprotein C and other RNA-binding proteins [(PUBMED:15312772), (PUBMED:9826776)]. There are 43369 ZnF_U1 domains in 17228 proteins in SMART's nrdb database. Taxonomic distribution of proteins containing ZnF_U1 domain. This tree includes only several representative species. The complete taxonomic breakdown of all proteins with ZnF_U1 domain is also avaliable. Click on the protein counts, or double click on taxonomic names to display all proteins containing ZnF_U1 domain in the selected taxonomic class. 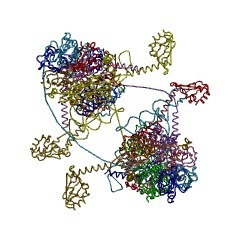 Zinc finger-like motif conserved in a family of RNA binding proteins. 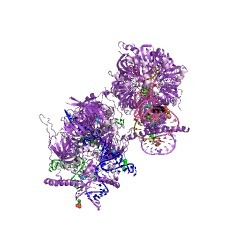 NP220s compose a family of RNA binding proteins together with matrin 3, one of major proteins of the nuclear matrix. They have repeats of RNA recognition motif (RRM; MH2) homologous to RRM in heterogeneous nuclear RNPs I/L in addition to MH1 and MH3 with unknown function. In search of additional homologous sequences, we found the reported sequence of rat matrin 3 is partially incorrect. 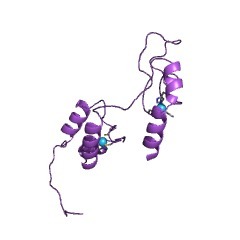 Correction of this sequence showed that the NP220 family has a fourth homologous motif with the characteristics of a Cys2-His2 zinc finger-like motif. The sequence of this motif is perfectly conserved in human and mouse NP220s despite their 75% overall sequence homology. 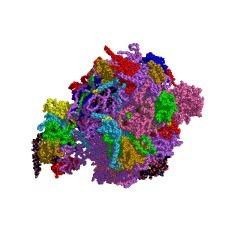 Molecular cloning of matrin 3. 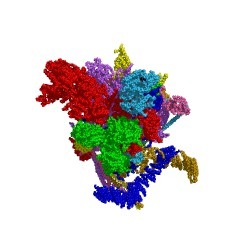 A 125-kilodalton protein of the nuclear matrix contains an extensive acidic domain. We report here the cloning and sequencing of matrin 3, an acidic internal matrix protein, from a rat insuloma cDNA library. The nucleotide sequence has a single open reading frame encoding a polypeptide of 845 amino acids. The Genbank and National Biomedical Research Foundation databases did not contain any sequences similar to that of matrin 3. The primary structure consists of 33% charged residues and is generally hydrophilic. 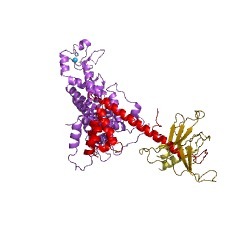 The amino-terminal region (residues 1-120) is positively charged and contains a large number of amino acids with free hydroxyl groups (26 of the first 100 residues) as in the lamins and several non-lamin intermediate filament proteins. A highly acidic domain (approximately 170 amino acids) near the carboxyl terminus, in which 32% of the amino acid residues are acidic (Glu or Asp), is a characteristic found in other nuclear proteins (Earnshaw, W. C. (1987) J. Cell Biol. 105, 1479-1482). A putative nuclear targeting signal sequence (Ser-Lys-Lys-Lys-Leu-Lys-Lys-Val-Glu) is located in the middle of the highly acidic domain. 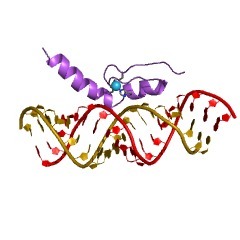 The corresponding human deduced partial amino acid sequence is 96% identical to the rat sequence, indicating that matrin 3 is a highly conserved protein. This information is based on mapping of SMART genomic protein database to KEGG orthologous groups. Percentage points are related to the number of proteins with ZnF_U1 domain which could be assigned to a KEGG orthologous group, and not all proteins containing ZnF_U1 domain. Please note that proteins can be included in multiple pathways, ie. the numbers above will not always add up to 100%.